Root canal therapy is a dental procedure used to treat teeth affected by infection, decay, or damage in the dental pulp and tooth nerve. 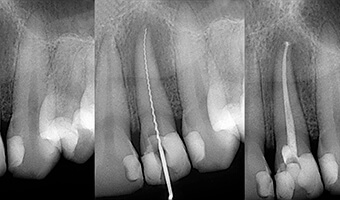 Root canal therapy can restore the health, function, and structure of severely injured teeth. Your gentle Annapolis dentists will first remove the infected or damaged portion of the dental pulp and nerve. After filling in the tooth, your dentists will cap the tooth with a dental crown to protect it and to improve its function. Root canal therapy can relieve tooth pain and improve your oral health. To learn more about root canal therapy and how it can improve your smile, we welcome you to contact us at Chambers Family Dentistry soon.